Overview: Arriving with the majestic snowy winterscapes and sparkling white downhills is this latest feature-rich, 5 reel 20 pay-line, entertainment-packed video slot complete with cool mountain graphics, bronzed ski instructors, Mounties, hibernating bears, snow bunnies and some easy-on-the-eye ski-girls showing the way to a generous mix of Free Spins, Scatters, multipliers and a major Bonus feature. Take the cable car up into the snowy slopes but stay on the alert for the ice castles and ski resort signs that can open up doors of opportunity. Ice Castles deliver up to 100 x multipliers and the capability to open up the second screen Hide and Seek bonus selection. The player can score up to 30 Free Spins with a 5x multiplier when the Ski Resort Scatter symbols combine. Get five of these adjacent and reap a massive 100x multiplier booster, too! 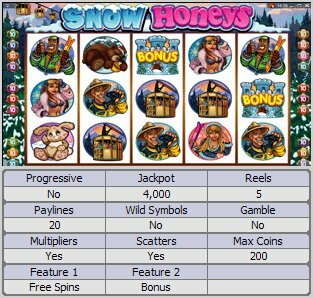 Snow Honeys incorporates the very best of bonus slot action, along with the ever-popular free spin reward concept, delivering great entertainment and ample chances to hit the big time. Similar Slots: If you like Snow Honeys, you might like these other 5-reel slot machines: Buffet Bonanza, Deck the Halls, Inca Gold, Magic Spell, Stunt Pilot.